Born on 15 May 1997 in Vernon (France), Ousmane Dembélé is widely regarded as one of the most promising young stars in European football. The forward is coming to FC Barcelona at the tender age of 20, having already proven his worth in the French and German top flights, where he’s already dazzled fans with his sublime skill and gutsy flair. The striker was spotted as a mere 13 year old by scouts from Rennes, and after four years at the Breton academy he had already amassed a fine reputation and was representing his country at youth international levels. 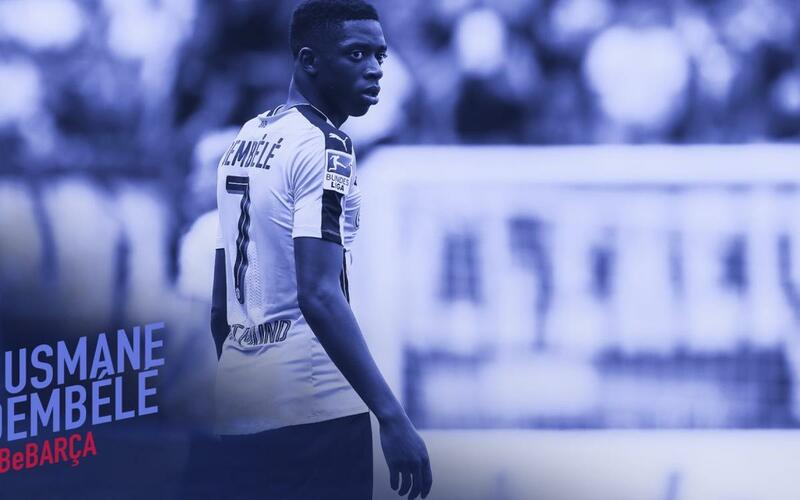 On 6 November 2014, and still only 17, he made his Ligue 1 debut against Angers. Two weeks later he’d score his first professional goal against Bordeaux. It was inevitable that an even bigger club would come knocking on the door, and that club turned out to be Borussia Dortmund in the summer of 2016. Dembélé soon adapted to life at Signal Iduna Park, scoring 10 goals and providing 20 assists in a single season. He played a central role in taking BVB to the quarter finals of last year’s Champions League and winning the DFB-Pokal, the German equivalent of the Copa del Rey. The expectations had been confirmed – a new star was shining in the football sky. His extraordinary dribbling skills have caused entire stadiums to swoon. He’s quick, and he’s willing to take risks, and thrives on troubling rival defences both for club and country, where scoring goals seems to come naturally to him. He can play with either foot, and can happily slot into both the left or right hand side of the attack. His young age is belied by some stunning career stats. In just two seasons since turning pro he has played 78 matches, scored 22 goals and supplied 25 assists. He already has seven international caps under Didier Deschamps and scored his first goal for France in the friendly against England earlier this year. His arrival at FC Barcelona is the culmination of his rapid-fire rise to the top. And the most wonderful thing of all – things are still only just starting for the 2016/17 Bundesliga Rookie of the Season.